Learn how to make a bulletin board to display informational items, pictures, and children's school work. The tack material is made of plas-cork, which is superior to the traditional cork material. It comes in a variety of colors, is washable, and is less likely to crack or disentegrate. The frame is routed and shaped from cherry lumber which will add charm to where ever it is displayed. Various sized boards can easily be made by simply altering the dimensions. 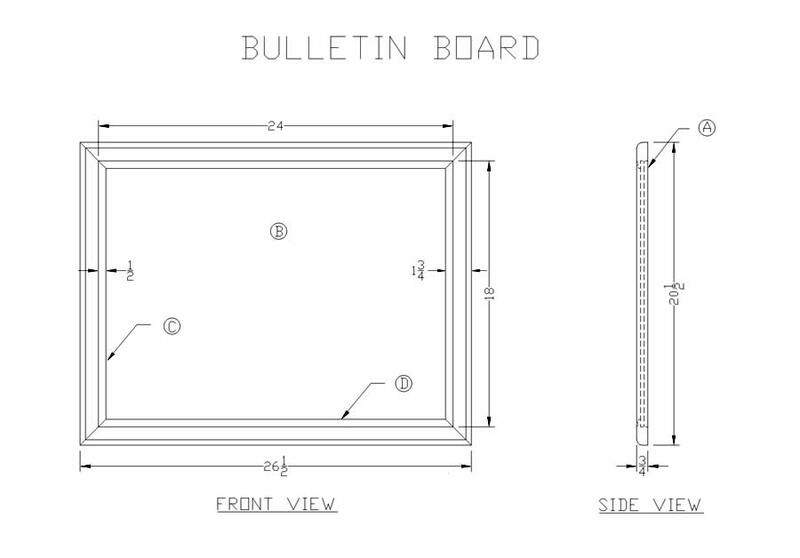 1/4" x 18" x 24"
3/4" x 1 3/4" x 20 1/2"
3/4" x 1 3/4" x 26 1/2"
The frame will require a piece of cherry lumber 1" x 2" x 48". Plane the board 7/8" thick. Use a table saw to rip two boards 1 13/16" wide. Joint the two boards 1 3/4" wide. Clamp the two boards to a work bench. Use a router with a 1" round-over bit to route the front/outer edges of each board. Use a router with a 1 1/8" Roman ogee bit to route the front/inner edges of each board. Use a table saw with a dado blade to cut a 1/2" x 1/2" rabbet joint on the back/inner edges of each board. Note: The dado joint should be opposite the Roman ogee shape. Use a radial arm saw to cut 21" off each board. Use a power miter saw to cut 45 degree angles on each end of the four boards with the face down. When finished, two frames (C) should be 20 1/2" long and the other two frames (D) should be 26 1/2" long. Adjust the table saw blade to 45 degrees. Adjust the height of the blade to cut a 1/2" deep groove for a blind spline in the ends of each mitered frame (C) and (D). The blind spline should start approximately 1/4" from the outer edge. Note: The spline should not show when the mitered corners are assembled. Use a table saw or a panel saw to cut the 1/4" fiberboard back (A) 18" x 24". Cut the 1/4" plas-cork tack board (B) 18" x 24". Note: Plas-cork comes in approximately a dozen different colors. Rough sand the frames (C) and (D) and the back (A) with an orbital sander and 80 grit sandpaper. Hand sand all edges, rounded areas, and routed areas with 220 grit sandpaper. Place wood glue on the mitered ends of the frames (C) and (D). Also place glue in groves for the splines. With a mallet tap the splines in place. Tap the frames together with a mallet and use a band clamp to secure the frame assembly. Clean up any excess glue and use a framing square to assure that the frame assembly is square. Allow the glue to dry over night. Spray adhesive on one side of the fiberboard back (A). Attach the plas-cork tack board (B) onto the back (A). Make sure the edges age flush. Lay the back-tack board assembly upside down on a clean flat surface. Place heavy objects on the assembly to assure proper adhesion. Place frame assembly upside down and attach the back-tack board assembly with metal swivel clips (G). Note: Step #9 should be completed after the completion of the finish procedures. Use wood screws to attach the picture hangers (E) onto the vertical frames. The hangers should be attached approximately one third the distance from the top. When the wood dough is dry hand sand with 220 grit sandpaper. If stain is desired, apply with a brush and allow to dry penetrate for 5-10 minutes, and then remove with a clean rag. Use a brush to apply a clear finish coat such as Varathane, Polyurethane, lacquer, etc. Allow to dry 12 hours. If additional finish coats are desired, repeat steps #5 and 6. 9. Allow 24 hours for the finish to dry sufficiently. Notes: 1. Be sure to match the color of the wood dough to the stain color or the finish color. 2. Use a tack rag after each sanding procedure to remove the dust. Measure the distance between the centers of picture hangers. 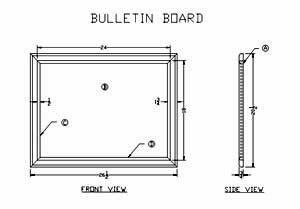 Determine the placement of the bulletin board, and mark the distance for the pictures hangers on the wall. Be sure the marks are the same distance from the ceiling. Use a portable power drill and a 1/4" drill bit to drill a hole through the wall at each mark. Tap the hollow wall anchors (F) into the wall with a hammer. Use a screw driver to chinch the anchors to the wall. Unscrew each machine screw a couple of turns. Hang the bulletin board on the machines screws. *Congratulations, your Bulletin Board is finished and ready to use!